This is an excerpt of “The E-Commerce Book” — the best selling book about E-Commerce and Amazon in Europe. Regardless of the prospects of high sales it offers manufacturers — or indeed pre­cisely because of these prospects — Amazon is not benign. The Trojan Horse, the Pied Piper of Hamelin, Hansel and Gretel, or indeed Doctor Faustus: you can choose your cautionary tale and apply it to the way relations between manufacturers and Amazon tend to run their course. First, the Giant is all sweetness and light, buying in product at attractive conditions, providing the Maker with plenty of sales and even undertaking efforts to put buyers his way — only, later, to let slip its mask and start abusing its power. Suddenly, the Maker sees that he is at the mercy of the Giant, and needs to act fast to save his city/get his children back/escape from the oven. In Faustian terms: Amazon offers manufacturers the potential to grow faster and bigger than in their wildest dreams, but the price is nothing less than their soul — i.e. their products. Yet beyond this allegorical sketch, how does the archetypal Amazon-Manufacturer relationship develop in detail? 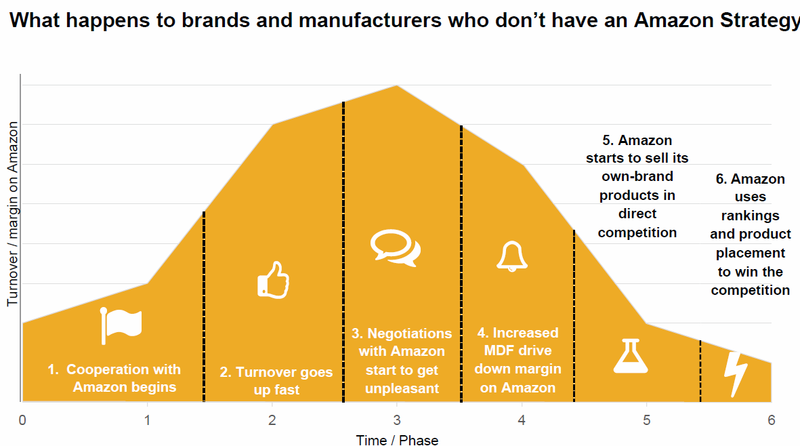 Manufacturers who start selling on Amazon almost always experience a tangible uptick in turnover — which is hardly surprising given the size of Amazon’s sales overall. While the Giant is very guarded about its actual turnover figures and uses highly idiosyncratic accounting techniques to disguise the exact provenance of its sales from competitors (and, in some cases, the taxman), it is not wildly overstating the case to put Amazon’s overall share of e-commerce sales at near 50% in most Western markets. Amazon is only so happy to handle returns because this allows it to implement its own extremely high standards of customer service automatically; it expects precisely this level of service from its suppliers, too, however — as manufacturers discover if they have trouble making deliveries on time and as agreed. 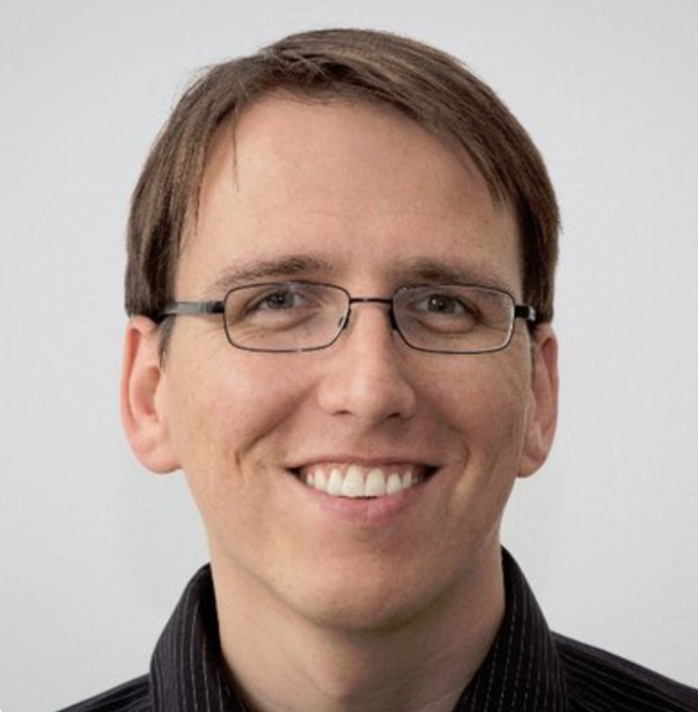 Amazon op­erates a zero-tolerance policy towards supply issues, and does so for a very good reason: because Amazon’s competitive advantage is, to a large extent, derived from its fulfilment structures — it is process optimisation here which gives it the reserves to be able to offer both suppliers and customers best prices — any disruption to its logistics system, however small, starts to eat into its margins. That is why sales agreements often include punitive fines for late or non-compliant deliveries: exam­ples include a 60 euro cent fee per item delivered to the wrong warehouse, a €20 fine per product not in agreed packaging, and a €500 lump-sum punishment for missing or cancelled deliveries. Breaches of agreements are recorded on the notori­ous Vendor Score Card and any supplier with poor marks in logistics can expect to be dressed down and asked to accept worse conditions during annual negotiations. Forgive and forget? “Goodwill gestures” are all Greek to Amazon. Even manufacturers who dovetail effortlessly into the Amazon logistics system can quickly find themselves paying a premium to sell on the platform. Amazon does indeed offer a good price for the products it buys in, but claws back some of this by selling additional services at a premium. Larger producers, especially, often lose track of their spend as whole teams are put together to handle the sudden jump in turnover: even premium brands such as WMF (cutlery), 3M (consumer goods), and L’Oréal (cosmetics) take part in the Special Vendor Services programme and actually pay wage costs for the Amazon staff who work on their brands (providing them with training beforehand out of their own budgets, too, of course). Amazon even takes a fee for inputting longer product texts. Buying in all of these extra services does not mean, however, that the suppliers concerned are buying real partnership; in fact, they don’t even get a courteous greeting when they pick up the phone. Amazon’s vendor managers usually have about 350 companies on their books, tend to change jobs within the organisation on a regular basis, and so like to use impersonal group e-mails to do things like ask for discounts from manufacturers who are now well-established in the shop and booking high turnover. If you know where to look, you can see the sheepskin falling to the floor. Yet how could this be achieved? As a classic example from game theory shows, it is almost inconceivable if we look at the situation between Amazon and manufac­turers as a classic Prisoner’s Dilemma. "Two suspects are imprisoned and stand accused of having colluded to com­mit a crime. They are both being held in solitary confinement and are ques­tioned individually, leaving them to no chance to coordinate their responses. If found guilty, the highest possible sentence for the crime of which they stand accused is six years. If both prisoners decide, independently of one another, to remain silent (cooperation), they will both receive shorter sentences of two years each. If each betrays the other, however, they will both receive longer, but reduced prison terms of four years each because they have helped the authorities (defection). If only one confesses, betraying the other (defection) while the other does not talk (cooperation), then the one who turns gets a symbolic one-year sentence while the other is given the full maximum penalty of six years." "For each individual prisoner, the most attractive option is to betray the other: assuming that the other party is also intending to betray them, turning will reduce the sentence from six to four years; even if the other party is intending to keep schtum, then betrayal still halves the remaining sentence from two years to one. From an individual point of view, then, there is no better strategy than be­trayal, and this remains so regardless of what the other prisoner decides; it therefore always appears more advantageous to turn. This strategy, chosen independently of the other player, is called the “dominant strategy”. The core of the dilemma is that an individual and a collective analysis produce different recommendations. Both players should actually cooperate to get the best result overall, but they both decide to betray and get the maximum pen­alty: their joint loss if they both cooperate is four years’ jail time; if they both betray one another, they will serve a total of eight years in prison." Regardless of the high number of manufacturers, we can still carry out the exercise with two parties, A and B, because the decision of only one manufacturer has the same influence on the remaining 999. If only one manufacturer stops selling to Amazon (“cooperates”), the others who are still selling to Amazon (“defect”) do better: the one who stops loses the turnover as long as the others keep selling, and those who are still selling can divide up the same turnover among themselves, each getting slightly more. If, however, all manufacturers were to stop selling to Amazon — i.e. to cooperate — then they would all suffer a drop in turnover — let’s put a price-tag on it and call it 10% for the sake of the game. If all of them continue selling to Amazon, however, then they lose, say, 50% of the turnover (and probably a lot more of their mar­gin) because Amazon’s market share grows even faster and it is more able than it would otherwise be to replace existing vendors’ products with its own or squeeze their margins. If only some of the manufacturers stop selling to Amazon, then the rest are better off because this lost turnover gets shared out among them. The businesses who “cooperate” lose, for the sake of argument, 70% of their turnover because Amazon continues to dominate the market and they are no longer prof­iting. Those who “defect” and keep selling only lose 5% of their turnover because there is more space for them on Amazon (although they too stand to lose far more in the long run). Yet from each individual manufacturer’s point of view, continuing to sell to Ama­zon appears to be the dominant strategy. This is an excerpt of “The E-Commerce Book” — the best selling book about E-Commerce and Amazon in Europe.